Submitted by lynn on Friday, January 26, 2018 - 8:46pm. 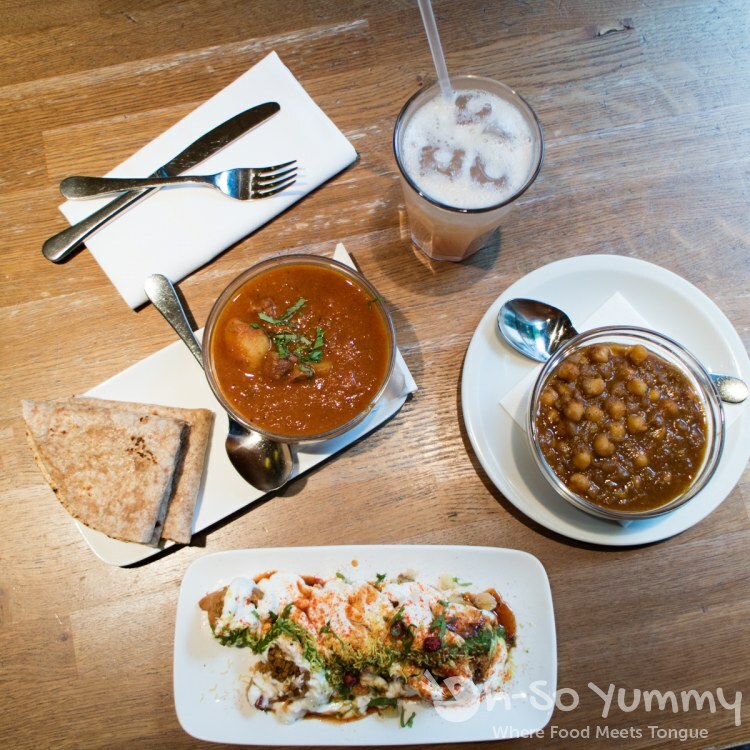 If you're struggling on what cuisine to eat first, Roti Chai brings modern Indian food to the table. We arrived in London around lunchtime and found our way there by tube plus a brief walk. The spacious eatery was calm that morning and we had options galore with their tapa style selection. This is just a sampling of what we ordered. On the right was the Kabli Chana (£4.20), a dish that bathes chickpeas in a savory sauce of spices. Across from it was the Railway Lamb (£8.50), a slow braised stew accompanied by pita bread. Dennis ordered a refreshing drink named Kovalam Beach (£3.90) to help wash it down. Get ready for your food closeup! 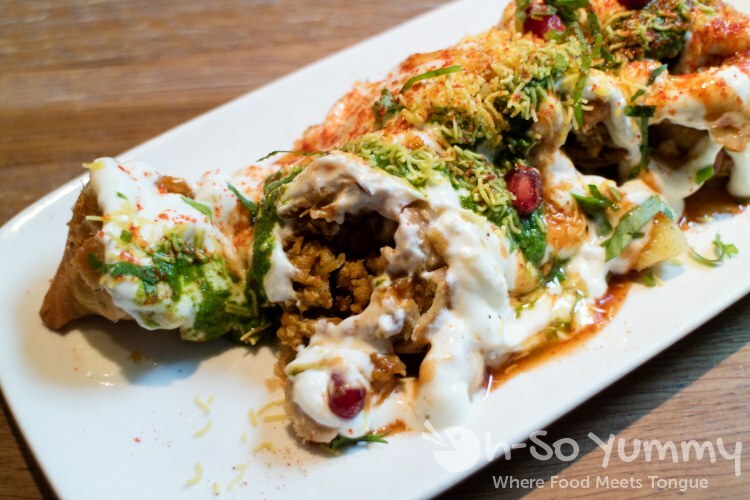 The bottom item was the irresistible Chicken Samosa Chaat (£5.90)... fried wrappers stuffed with minced meat and veggies, all drizzled in refreshing yogurt, parsley sauce, and a pomegranate seed tang. 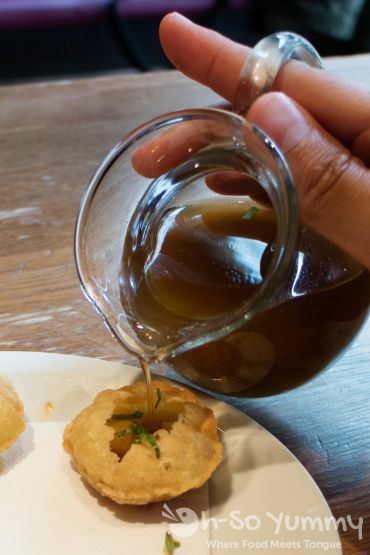 The Pani Puri (£4.80) came in a plate of five plus a mini pitcher of chutney. Just pour some of that liquid gold into each cavity then shuttle it to your mouth! 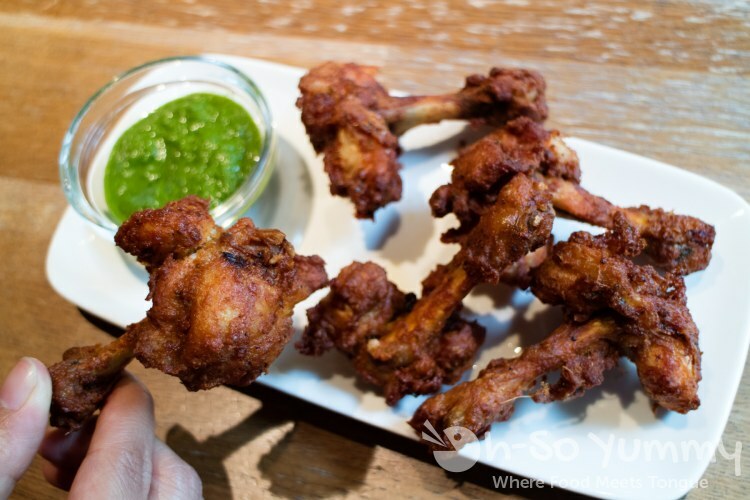 Despite a "meat pushed off the bone" look, the Chicken Lollipops (£5.50) came out piping hot with a wonderfully spiced skin. The mint chutney was a perfect side to help cool the tongue! After picking up our bill, we noticed a discretionary service charge of 12.5% listed. This seemed to be a common thing when we were eating out in London so just a heads up! Fish and Chips became one of the must-have items on our London foodie list. 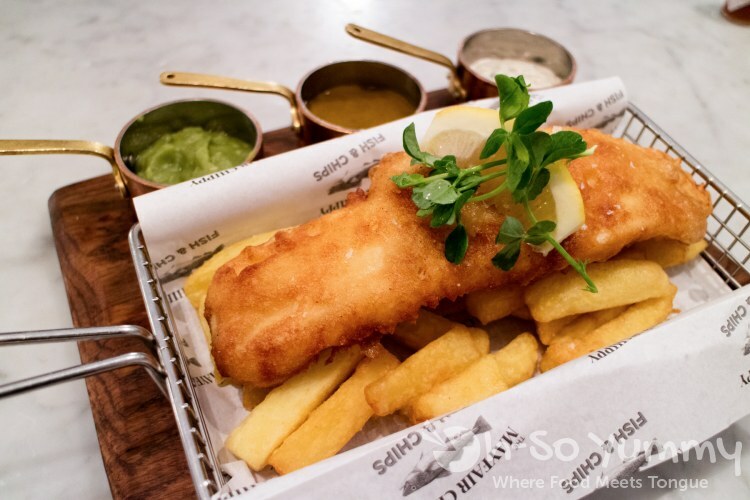 When our sudden craving for this popular British fare hit that evening, Mayfair Chippy became the perfect place to satisfy it! Seriously, just go straight for the Mayfair Classic (£15.75). The fish options were fried cod or haddock and it arrived with a trio of sauces: mushy peas, tartar & chip shoot curry sauce or HP gravy. Dennis to this day still gushes about the amazing fish and chips from here as we search locally for something up to par. This beautifully presented Sharing Platter (£22.50) was just begging us to explore other menu possibilities. I dove right in, slurping all six briny oysters, especially since Dennis doesn't eat them. There's something for everyone here. 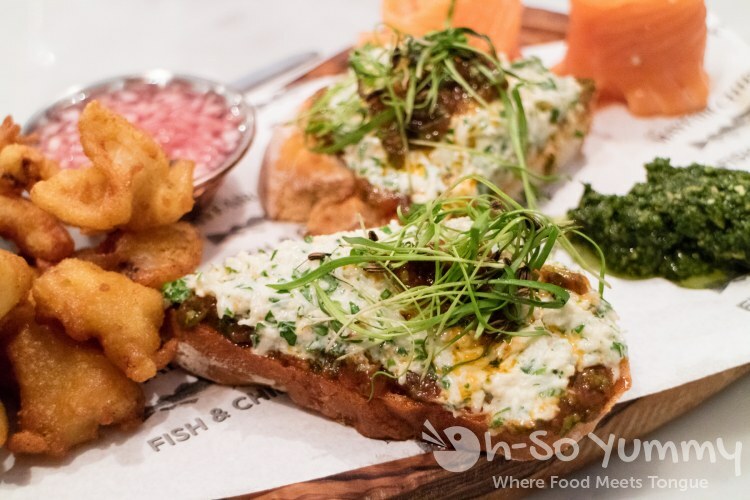 Battered squid for the fried food lover, rolled up smoked salmon paired with parsley pesto, and fancy crostinis topped with crab salad and avocado. Every new bite made us happier. 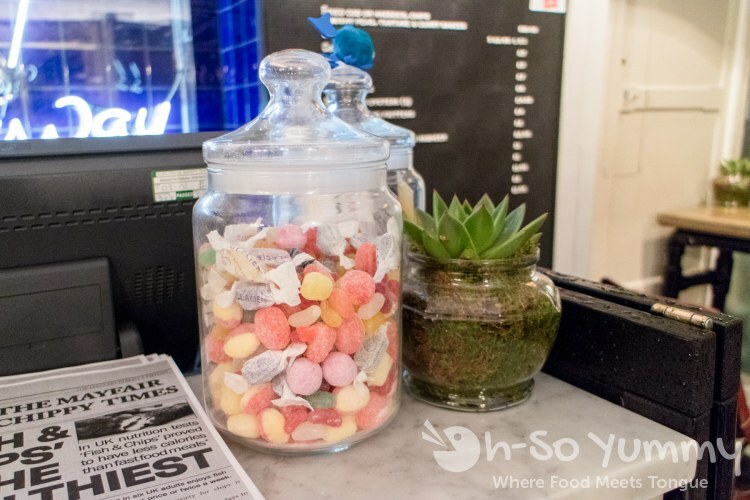 We grabbed delicious English hard candies on our way out, held hands and skipped away in satisfaction. For a change of scenery, there's a local pub called Churchill Arms hiding beneath spreckles of flowers and greenery. This place provided both a fine drinking space as well as affordable Thai food for our second night's dinner. The Pad Si-Ew (£9) held a bounty of noodles and was enough to please the average appetite. We chose the mixed meat (beef, pork, chicken), loving the grilled meat interspersed with saucy flavor. 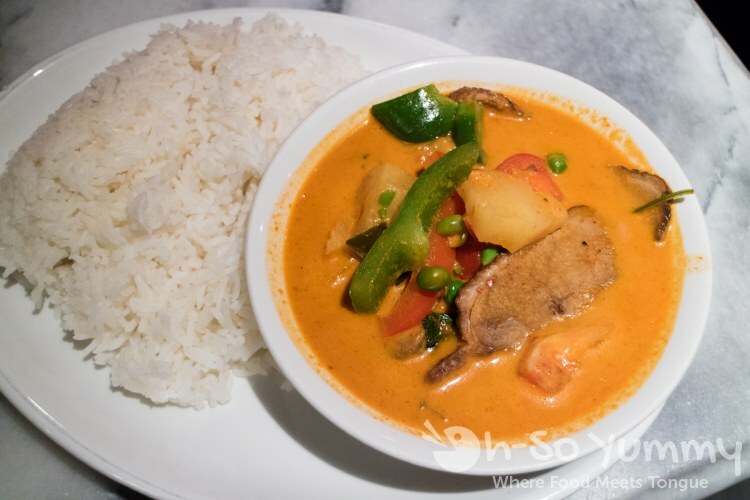 For a creamy dish, we picked the Panang Curry (£9) with a choice of spicy, hot, or very hot! We asked for the bare minimum which had a hint of spice in the yummu curry. Our protein of choice was roast duck but it was sparse compared to the other dish. The portions were still generous, especially the mound of rice to soak in the thick stew. Our wait time to be seated was 10-15 minutes. The first thing our server spoke about was the 1 hour time limit and we barely got our order in 15 minutes after. Luckily food appeared quickly and was devoured just as fast. This practice kept the flow of diners smooth during busy service hours. Almost all the dishes were £9 each so this was easy on the budget. On the other side, the pub section appeared quite cheerful! Beers on tap kept flowing, charming the smiles onto everyone's faces. 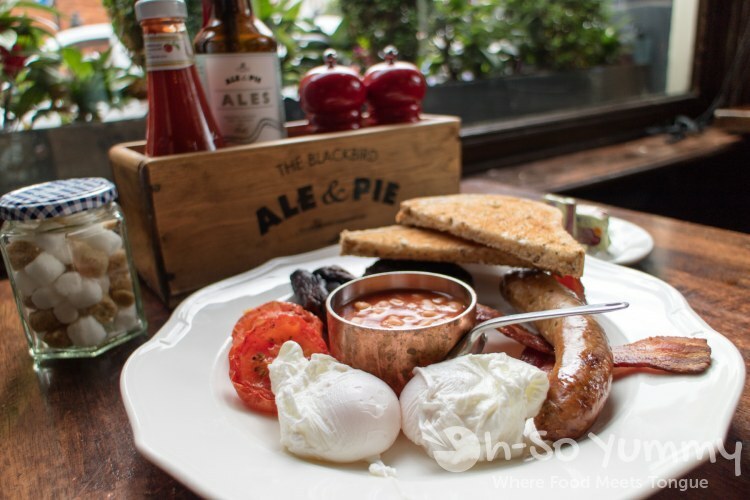 What else could represent UK's cuisine better than the English breakfast or British meat pies? After waking up too late for the famous changing of the guards, we pacified ourselves with lunch at Blackbird, just 1 mile from Kensington Palace. We found tasty examples of both here and consequently knocked off more items on our evolving food checklist! Behold the Full English Breakfast (£9.95). This meal presented some familiar finds: bacon, sausage, eggs and bread. Newer to us were the pinto beans, roasted tomato, and black pudding. The black pudding was surprisingly irresistible after one dark bite! I don't think we've EVER eaten this before our trip! 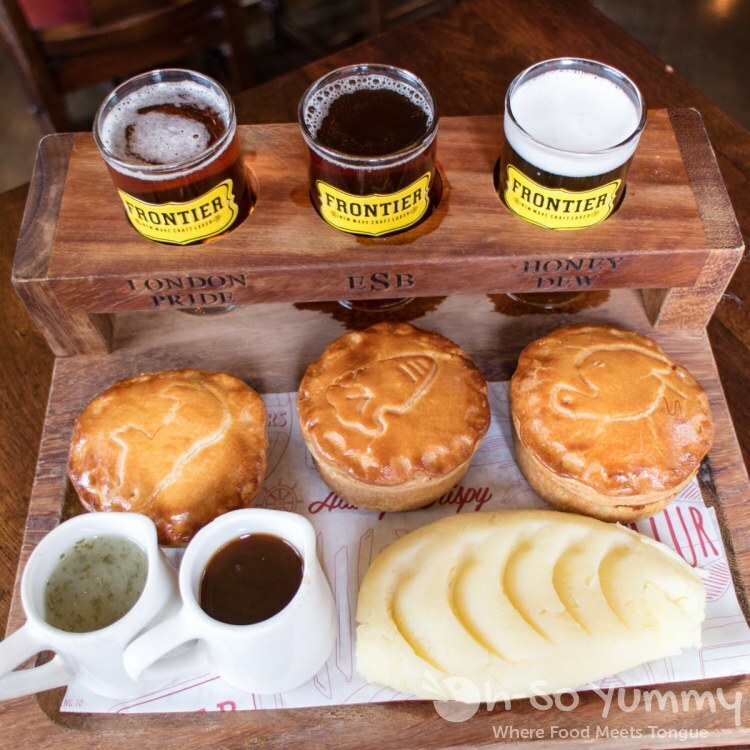 The tasting board for the Pie Tasting Plate (£18.45) was a real winner! Three holes in the raised platform held your beer samples while the fresh pies tempted us to break into that golden crust. The stamp in the crust indicated which flavor was inside. I'm holding the steak & london pride and below is the creamy root vegetable pie (vegetarian), then the five spiced duck & cranberry pie. The side sauces were gravy or pie liquor, another layer of yummy to mix into the pot. Oh, what a feast we had! London food was awesome but it was already time to travel to the next city. 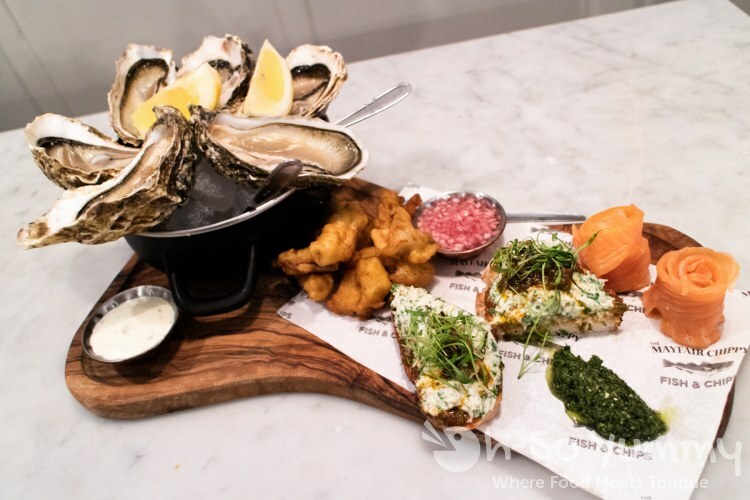 For more European food, check out our Paris Eats post. 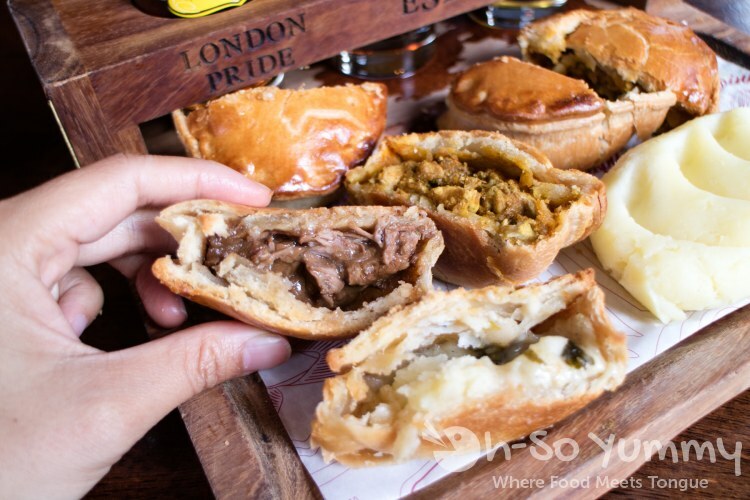 Have you had an English Breakfast or Meat Pies before? I've heard mixed reviews about the food in England, but now I really want to go! I love a meat pie. the food in london was better than in paris! we also hit up several great spots in amsterdam later that month. i have a bit of work to catch up on that post! 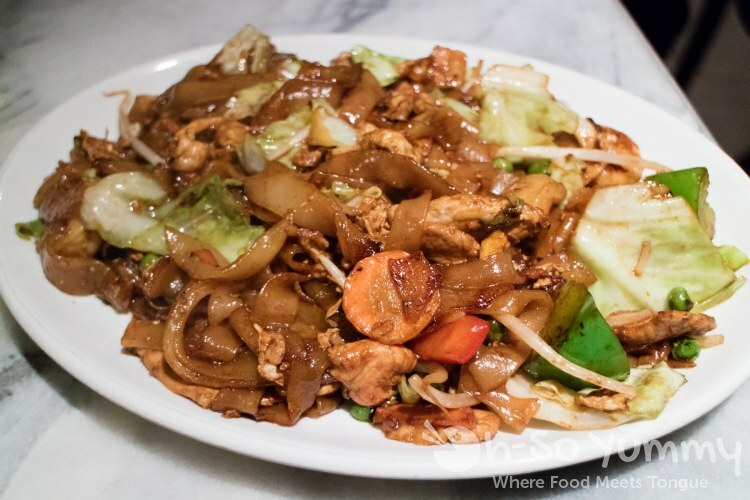 it's easier to plan food when you're not trying to sightsee in a brand new city! maybe we'll have a more leisure schedule for our next international trip!